Seven years to the day after Pacific NW Portal 3.5 (“Gearhart”, also known as “Marine Green”) was released, we’re proud to announce that we have completed work on a new version of Pacific NW Portal: Version 5.3, codenamed Depoe Bay. Depoe Bay is a maintenance release – the third in the Newport series. In other words, there aren’t any new major features… just bug fixes, updates to the index, and tweaks to functionality and branding to make things work better. Like every prior release, Version 5.3 is named after an Oregon coastal town. 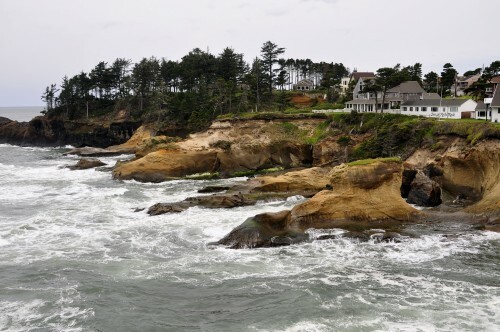 Depoe Bay is located in Lincoln County (between Newport and Lincoln City) and is home to almost 1,500 people. It claims to have “the world’s smallest harbor”. It is one of only seven incorporated cities in Lincoln County. The Inn at Arch Rock in Depoe Bay, Oregon. (Photo: Tony Cyphert. Reproduced under a Creative Commons license). This post constitutes our official changelog for Version 5.3. Please feel free to leave questions, suggestions for future versions, or other thoughts on Depoe Bay in the comment thread. New slogan. Since it launched in 2005, Pacific NW Portal has generally used two slogans (News & Information for Progressives, Political News From Around the Region). As of this release, Pacific NW Portal has a new slogan: Cascadia’s news hub. It replaces both of the old ones. The new slogan appears on Pacific NW Portal’s nameplate and in page titles. Updated nameplate. The nameplate has been restyled to reflect the new slogan, and the height of the nameplate has been increased slightly to create more “blue space” at the top of each page. (As a consequence, there is slightly more space around the navigation bar). The nameplate now depicts Mount Hood, Oregon’s highest point and the mountain closest to the Columbia River Gorge, which divides Oregon and Washington. Source feeds fixed. Several broken source feeds, like the Seattle Times’ Politics Northwest channel, have been removed and replaced so that the links are no longer broken. (Publications occasionally republish their feeds at a new location and don’t redirect the old feeds. We do our best to keep the source feeds as current as possible). Enhanced greeting for the morning hours. Pacific NW Portal now displays a photo of sunrise at Sunrise, Mount Rainier during the morning hours (Pacific Time) accompanied by the greeting “Good morning”. The image is from NPI’s photo library and was taken last July. Our thanks to everyone who continues to support Pacific NW Portal. Enjoy the new version! © 2019 The Northwest Progressive Institute. The Cascadia Advocate loaded in 0.174 seconds.